Are you entering the home buying or property investment market for the first time? Or wanting to build your portfolio but don’t know where to start? Armed with Property Prosperity, you can learn the right questions to ask yourself and the professionals in order to make successful and profitable 'investment-grade' buying decisions. Whether you are a novice or an experienced investor, Property Prosperity will give you all the information you need to avoid common pitfalls, make successful property buying decisions and build a prosperous property portfolio. Learn how to avoid common techniques used by real estate agents to trick unwary investors into buying unsuitable properties, and how to invest profitably, strategically and sustainably. Laid out like a workbook and filled with helpful strategies, models, exercises and case studies, Property Prosperity translates common property and investment jargon into layman’s terms that any investor can understand. Property Prosperity should be on every avid property investor’s bookshelf. It’s also packed with useful and practical information that applies to people looking to purchase a home to live in. Miriam Sandkuhler, founder of Property Mavens, is a successful property investor, award nominated Buyer's Agent, Accredited Property Investment Advisor (APIA) , Licensed Estate Agent and media commentator. Miriam is passionate about protecting buyers and enabling them to thrive from good investment choices. 5.0 out of 5 starsWhy invest in property without an expert in your corner? Miriam's book is so well written that I read it all in one sitting. Everything just made such good sense - why would would you rely on a selling agent when you're buying a property, they don't work for you. It's stupid not to have a professional in your corner to wade through all the selling agent BS! It's rare that a book will live up to it's title. This is one such book. 5.0 out of 5 starsA hugely valuable book for anyone who wants to be successful and prosperous in the complex world of property investing. Miriam Sandkuhler is an extraordinary real estate professional. She is passionate about helping people to make smart investment decisions and this passion comes out in "Property Prosperity". Her advice is straight forward, filled with integrity and common sense, and clearly, Miriam has the readers best interest at heart every step of the way. A hugely valuable book for anyone who wants to be successful and prosperous in the complex world of property investing. Andrew Griffiths, International bestselling author. my first property, I found myself questioning my decision, very stressed and looking for a way out. After reading this book, not only did I realise that I’d made the wrong decision for my level of personal risk, but I was also using the wrong strategy for my income level! No wonder I was stressed! Now I know I’m armed with the knowledge to make a much better decision next time around. As an experienced, though by no means expert, property investor in Australia, I wasn't sure whether Property Prosperity would be pitched at my level or too high or too simplistic. I was delighted when it arrived to see that the volume of information it contained managed to express some of the 'basics', as well as specific processes and charts that will help me with my next purchase and onwards towards prosperity. Miriam is not just knowledgeable in the area of property investment - she brings a realism that many other "Get Rich with Property, No Money Down" style books seem to gloss over. As a guide for those who want to build wealth with property and keep it, I can (and have) recommend Property Prosperity. 5.0 out of 5 starsProperty Prosperity guarantees a sound investment for any start up investor. A Property Mavens 7 Steps to Property Prosperity is simple, straightforward, concise and clear, step by step advice that when applied guarantees a sound investment for any start up investor, no matter age or education. 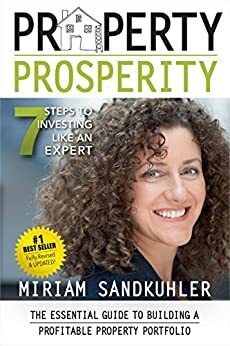 Not only is there great value in this book but many great values that you will come to trust as your compass when steering the course of your property prosperity future. If you are considering a property purchase of any kind you will learn, what you don’t know,what you need to know, and the order in which to chart your individual course. When it comes to investing for your future one size fits all advise does not fit all. Gaining the knowledge to be strategy specific and responsible in this financial arena is the hallmark of this considered rewarding and insightful new book. 5.0 out of 5 starsLike a pair of goggles that change the way you look at real estate. Most people approach property like a customer. They do what the bank wants, they buy the product the developer wants to sell, they get convinced by an experienced real estate sales person. This book flips things around and gives you the eyes and ears of a professional property investor. You step out of the retail customer mindset and into the mindset of a person who will make money from their property decisions. Thanks!